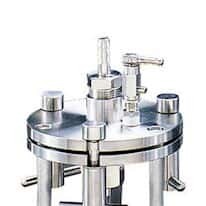 Pressure filtration holders maximize flow rates in membrane filtration applications by applying positive pressure to the fluid over a broad membrane surface. Pressure filtration holders are available in 304 and 316 stainless steel. We also offer pressure vessels, in-line filter holders, and stirred cells.